An appraisal of an indoor waterpark resort is similar to other appraisals in that it is a professional appraiser’s opinion of value. It is typically required by a lender before financing can be obtained for a new project. The scope of the project, including plans and development budgets, should be well defined prior to the start of the appraisal. When a project is ready for an appraisal, developers and lenders often seek out appraisers with industry-recognized qualifications which go beyond state minimum requirements. One such qualification, MAI membership, is offered by the Appraisal Institute. The MAI membership designation is awarded to appraisers who have met rigorous standards of education, experience and ethics. Members participate in continuing education to stay at the leading edge of their profession. For a project as complex as an indoor waterpark resort, it is beneficial to engage an appraiser who has extensive experience in the hospitality, resort, and waterpark industries. Appraisals of indoor waterpark resorts pose unique challenges. Since waterparks are still a relatively new product, many real estate appraisers may be unfamiliar with them and may not know the steps required to appraise such properties. An indoor waterpark resort is an entertainment-based hospitality property, and therefore has the potential to achieve substantially higher revenues than a typical hotel. Conversely, this same characteristic makes its operation inherently riskier than the operation of a typical hotel. In other words, an indoor waterpark resort is more sensitive to fluctuations in the leisure market, the economy, and the demographic composition of a market area. Because the success of an indoor waterpark resort is so dependent on the health of the market, an indoor waterpark resort appraiser must conduct a more comprehensive market analysis than he or she might for a typical hotel property. An appraisal should include a thorough market analysis and three approaches to determining the market value of the project. 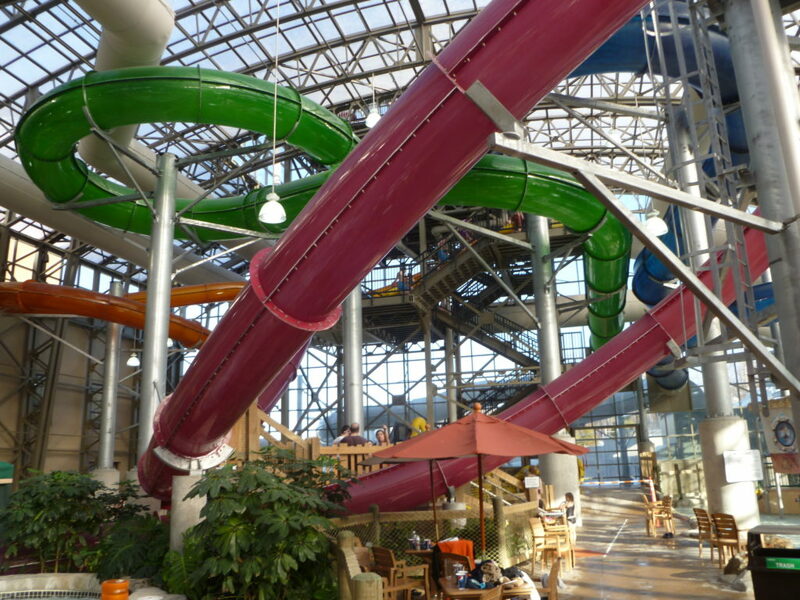 This article discusses the methodology for conducting market research and preparing an appraisal of an indoor waterpark resort. A thorough market analysis of the local hospitality and indoor waterpark resort market is an essential component of an indoor waterpark resort appraisal. The value conclusion will depend heavily upon the data gathered for this section. Therefore, market analysis is the first and biggest step when appraising an indoor waterpark resort. Market research encompasses a large range of data, but the following section identifies key areas an appraiser should consider when conducting market research for an appraisal. When gathering economic and demographic data, the appraiser should look within a 120- to 180- mile radius of the subject property and gather the following data. Population trends: What is the population in the area and is the number growing or shrinking? Household growth: How big is the typical household in the area? How many children are there per household? The number of children in the area is a particularly crucial data point since indoor waterparks are family-oriented facilities. Household economics: What is the unemployment rate in the area? What is the median income? How much disposable income do households in the area have? Area economics: What large corporations are in the area? Are there tourist attractions in the area? When answering these questions, an appraiser will look for existing demand generators as well as potential demand generators which are in the development stages. He or she will also look for demand generators which may be leaving the market soon. Area transportation: The number of airports, interstate highways, and rail stations greatly affects travel to an area; therefore, these factors must be considered. Comparative data: Once an appraiser has gathered economic and demographic data from the subject market area, a comparison can be made to the same data from the market areas of other successful waterparks. Two areas which are frequently used as comparatives are Wisconsin Dells and Sandusky. Projections: Based on the data gathered in this section, what is the projected performance of the subject property? Are there plenty of demand generators in the area to draw visitors? Are there plenty of families with children in the area who might visit the waterpark? For this set of data, the appraiser should order a hotel market report from Smith Travel Research (STR). An STR report profiles the daily, monthly, and annual occupancy, average daily rate, and RevPAR of a market area. He or she should also conduct research on hotels in the market area which are in the development stages. Additionally, the appraiser should interview the management of competitive hotels in order to gain a greater understanding of the state of the hotel market. The following factors are critical to the understanding of the hotel market. Existing competitors: How many competitors exist in the market? To what degree are they competitive in terms of amenity offerings, affordability, etc.? How have they performed in past years in terms of occupancy, ADR and RevPAR? Recent hotel openings: How many hotels have opened in the past few years and what impact have those openings had on the existing market? Potential hotel openings: How many hotel projects are in the works? What types of hotels will they be? How many rooms? What is their projected impact on the current supply and demand situation in the market? Market segmentation and market penetration: What is the market segmentation and penetration of each competitor in the market? The appraiser will want to look at all market segments but give special attention to the leisure market since an indoor waterpark resort targets this segment. Those hotels in the area which garner the largest share of the leisure market will be the subject property’s biggest competitors. Projections: Synthesize the data gathered in the previous steps and project the performance potential for the subject property. Based on the current market situation, is the subject likely to perform well in terms of occupancy and ADR? What are its potential penetration rates and market segmentation? Indoor waterpark resorts tend to perform better than hotels without indoor waterparks in terms of occupancy and ADR and must therefore be looked at separately. As with the hotel market, the source for these data should come from a Smith Travel Research Lodging Trend report, research on potential developments and interviews with competitive indoor waterpark resort management. Below are things to consider. Existing and potential competitors: How many other indoor waterparks are there in the area? How many are proposed in the area? How are existing waterparks performing in terms of occupancy and ADR? To what degree will existing and potential waterparks be competitive in terms of waterpark size, amenities, etc.? Waterpark pricing and usage: What are waterparks in the area charging for use of their waterpark? How many visitors do they receive in a year? For these data, it is important to look at waterparks attached to hotels as well as those which are separate. Projections: Based on the data gathered above, how many waterpark visitors can the subject property expect, and will these visitors come from the subject hotel, nearby hotels, or will they be local residents? What is a reasonable rate to charge for admission to the waterpark? Information specific to the subject property is collected in the following areas. Financial data: When appraising an existing property one needs to interview the management and obtain historical financial statements from them. For a proposed property, the interview will be with the developer, and the appraiser will need to obtain the financial forecast and the development budget. Performance data: If the property is existing, historical market segmentation reports, usage figures, and other performance statistics are needed. Physical plant information: For an existing property one will look at the building plans. For a proposed property, the appraiser will obtain the architectural plans. Governmental impacts: The subject’s ad valorem taxes, zoning information, sales history, governmental restrictions, environmental regulations and other factors which may affect the subject property should be collected. The initial step in the appraisal is to conduct the market analysis described above. This systematic research and analysis is crucial in reaching a value conclusion for an indoor waterpark resort. The next step is to incorporate the research and analysis with other financial data to determine market value. A hospitality property appraisal requires a more detailed analysis of the in-depth operations of a property than a typical commercial property appraisal. An appraisal of a hospitality property is usually of the going concern of the property (market value of the operating business), and valuation is divided among the real estate, furniture, fixtures, and equipment, and any intangible value (business value). Approaches to Appraisal: The three primary approaches for real estate appraisal are the income capitalization approach, the sales comparison approach and the cost approach. Although each method yields an estimate of market value, each does so in a different way. Therefore, it is important for an appraiser to choose an approach which will be appropriate for the type of property being appraised. Below is a detailed description of each approach along with commentary on the applicability of each approach to the appraisal of indoor waterpark resorts. The Income Capitalization Approach: This approach analyzes the property’s capacity to generate income (or other monetary benefit) and converts this capacity into an indication of market value. The approach is most suitable for hospitality properties in general and indoor waterpark resorts in particular because their values are based primarily on their cash flow. Within the income capitalization approach there are two methods which could be used: direct capitalization and discount cash flow. Direct capitalization converts an estimate of a single year’s income expectancy or an annual average of several years’ income expectancies into an indication of value in one direct step and is most applicable to properties that have achieved a stabilized level of operations and occupancy. The discounted cash flow (DCF) analysis is a market reflective method of estimating the present worth of anticipated income benefits – it converts a stream of expected income into a present value and is most appropriate for properties that have not yet reached stabilized occupancy. The appraiser should analyze and estimate various revenue and expense categories in determining the projected net operating income and value for the property. The projections for the property’s occupancy and average daily rate performance are determined through the market analysis section as previously described. For the other revenue and expense categories, the appraiser should analyze the proposed subject property’s budget, actual operating results of other indoor waterpark properties, and industry standards for hotels from reports such as the Host Study. One should analyze the various departments of an indoor waterpark resort including outside waterpark sales, arcade revenue, gift shop, restaurants, lounges, meeting space, telephone, and other departments. Expenses for each of these departments should be estimated based upon an analysis of historical results and results from comparable indoor waterpark facilities. The discount rate and terminal capitalization rate for the analysis should be estimated based upon the industry surveys for hospitality properties, taking into account the unique risk and income characteristics of an indoor waterpark resort property. The Sales Comparison Approach: This approach compares the subject property to other properties that have changed hands fairly recently, at known price levels. The reliability of this approach depends directly upon the quantity and quality of available market data. Because of this heavy reliance on market data, this approach is more difficult for indoor waterpark resort properties. There is a relatively limited supply of indoor waterpark resorts in relation to the total number of hotels in North America; therefore, there have only been a few indoor waterpark resort sales. This makes it difficult for the appraiser to find adequate market data; however, market data is available to the diligent appraiser. When using the sales comparison approach for an indoor waterpark resort, the appraiser should fully analyze any actual indoor waterpark resort sales as well as sales of non-waterpark hotels of comparable quality. One should obtain information such as sale price, historical occupancy, average daily rate, financial performance, renovation cost information, amenity offerings of the property, and special circumstances concerning the sale. Once the sales data have been fully analyzed, the appraiser will probably find a wide range of values. Therefore, the appraiser will need to use an adjustment grid to account for differences in location, size of the property, time and circumstances of the sale, etc. Through the adjustment grid, the appraiser can project a value for the subject property. The Cost Approach: In this approach, the cost to replace the improvements is estimated. Once replacement costs are determined, a deduction is made for any depreciation. The result is then combined with the estimated value of the underlying land. This approach is especially appropriate when appraising a proposed development where development budgets and land cost are available. When using this approach, one would first analyze the sale prices of existing land parcels near the subject site and project a value for the subject’s land using a method similar to the sales comparison approach described above. Next, one would compare the budgeted development costs with costs from an estimating service to determine if they are reasonable. Finally, the appraiser would project a value for the subject property by adjusting the development costs for depreciation and combining the result with the land value. Applicability to Appraisal Assignment: The Income Capitalization Approach is the most appropriate method for estimating the market value of an indoor waterpark resort or other hospitality property because this approach relies upon data from the market analysis for determining an estimate of value. The Sales Comparison Approach and the Cost Approach should be utilized to provide additional points of reference with the knowledge that there are limits to their relevance for indoor waterpark resorts. Conclusion: The appraisal of an indoor waterpark resort requires analysis and expertise beyond what is required for the appraisal of a typical hotel or other commercial real estate property. Unlike other types of appraisals, a waterpark resort appraisal requires a thorough market analysis involving a study of the economic and demographic factors as well as a review of the hotel and indoor waterpark resort markets. It also requires a complete financial analysis which looks at various revenue categories. When appraising an indoor waterpark, the appraiser must have a full understanding of waterpark usage issues and a firm grasp on the trends in the indoor waterpark market. Author: David J. Sangree, MAI, CPA, ISHC is President of Hotel & Leisure Advisors, a national hospitality consulting firm. He performs appraisals, feasibility studies, impact studies, and other consulting reports for hotels, resorts, waterparks, golf courses, amusement parks, conference centers, and other leisure properties. He has performed more than 1,000 hotel studies and more than 200 indoor waterpark resort market feasibility and/or appraisal studies across the United States and Canada. He was formerly employed by US Realty Consultants in Cleveland and Columbus, Pannell Kerr Forster in Chicago, and Westin Hotels in Chicago, New York, Fort Lauderdale, and Cincinnati. David received his Bachelor of Science degree from Cornell University School of Hotel Administration in 1984. He became a certified public accountant in 1989. He became an MAI member of the Appraisal Institute in 1995 and a member of the International Society of Hospitality Consultants in 1996. Since 1987, David has provided consulting services to banks, hotel companies, developers, management companies, and other parties involved in the lodging sector throughout the United States, Canada, and the Caribbean. He has spoken on various hospitality matters at seminars throughout the United States and on Good Morning America and CNBC. He has written numerous articles for, and is frequently quoted in, magazines, television, and newspapers covering the hospitality field. He can be reached at 216-228-7000 extension 20 or dsangree@hladvisors.com.